Laura Carno is a Republican activist in Colorado who has long fought for individual rights. She is a strong advocate for Second Amendment rights and was a key part of the 2013 recall effort that flipped the Colorado State Senate. Recently, she wrote a book called “Government Ruins Nearly Everything”. Below is a quick Q &A with Carno about her book, which is the number one seller in its category on Amazon. What made you pick the title “Government Ruins Nearly Everything”? Each side of the political aisle has issues where it wants the government to stay out of our lives, and issues where it wants the government to intervene in our lives. The message of Government Ruins Nearly Everything is that the government almost never improves big societal problems. This sounds like a pretty big topic. 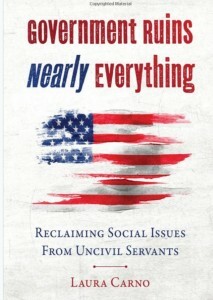 What issues do you tackle in “Government Ruins Nearly Everything”? I focused on what I call the four “Fireworks Issues”, those issues that are the subject of intense political focus. They are also the issues that are very personal, heart-felt, and often faith-based. Those issues (each with their own chapter) are Reducing Abortions, Less Gun Violence, Schools That Work, and Strong Marriages. The central question is: If these issues are so important to us, why would we turn them over to the government to fix? The government ruins nearly everything it touches. What do you expect readers to learn from your book? I want readers to read this book with an open mind about each of the “Fireworks Issues” and how they believe those issues can be improved. Many people aren’t aware of those individuals and organizations that work quietly every day —outside of government— to make improvements. I tell their stories in my book. Why do you think your book has done so well, so early? It echoes what many people have already been thinking. Not that we should stop talking about social issues, but that we should do things that work. And that government isn’t the place for that. And finally, how can PeakNation™ buy your book?